In today's readings there are two mountains: Mount Moriah and Mount Tabor. Two fathers summon their sons, one to one mountain and the other to another mountain. In the first instance, the father, Abraham, is instructed to sacrifice his only son with his wife Sarah on Mt. Moriah. This son, Isaac, was improbably conceived well after Sarah had passed through menopause it seems. His name, Yitzak in Hebrew, means laughter and refers to Sarah's response when informed she would conceive and bear a son in her old age. It seems reasonable to infer that it would be through Isaac that God would fulfill his promise to make of Abraham's descendants "a great nation" (Gen 12:2). Great nation aside, it seems an abominable request that God made of Abraham in order to "test" him. The Hebrew word translated as "test" in Genesis 22:1, which transliterates as nse, literally means "probed." I take this to mean God issued a call to Abraham to see what his response might be. The Hebrew word nse has been translated into English using a variety of words, including "tempt," as in "God did tempt Abraham" (KJV). Whether God tempted Abraham to kill his son or tested him by requesting that he do it, this passage is troubling. It remains troubling despite the fact that Abraham, in the end, is not required to actually kill his only son. Frankly, it is difficult to determine which is more disturbing, God's directing the murder of Isaac or Abraham's willingness to carry it out. The deeply disturbing nature of this story is not wholly mitigated by our recognition, as Christians, that it is a foreshadowing of the Father permitting his only Son to be sacrificed on yet another mountain: Calvary. If this story doesn't bother you, doesn't get under your skin a bit, then you're not paying attention or you don't care. It's an excruciating encounter with the Mystery whom we call "God." That the story of Abraham's attempt to murder his son is a foreshadowing of the Father sacrificing his Son is borne out by our second reading, taken from St Paul's Letter to the Romans: "If God is for us, who can be against us? He who did not spare his own Son but handed him over for us all, how will he not also give us everything else along with him?" (Rom 8:31b-32). We know that, unlike Isaac, who seemed an unwitting and uninformed participant in the event that occurred on Mt. Moriah, Jesus undertook his passion and death in full awareness and voluntary obedience to the Father out of love for our sake. Rather than an account of Jesus's crucifixion for our Gospel reading today, we have St Mark's account of his Transfiguration. Jesus's Transfiguration was a preview of the glory of his resurrection. It is also a sure sign that he is the fulfillment of the Law and the Prophets. This is attested to both by the appearance and subsequent disappearance of Moses and Elijah. After Moses and Elijah disappeared, Peter, James, and John heard the voice of the Father say, "This is my beloved Son. Listen to him" (Mark 9:7). Then "they no longer saw anyone but Jesus alone..." (Mark 9:8). I like St Mark's account, which was probably the earliest written, because it shows how confusing this was for the three men who accompanied Jesus up Mt. Tabor. Mark makes clear that Peter suggested building the three booths because he had no idea what else to say (Mark 9:5-6). As they made their way down from the mountain, Jesus charged them to not say anything to anyone about what they witnessed until after he had risen from the dead (Mark 9:9). 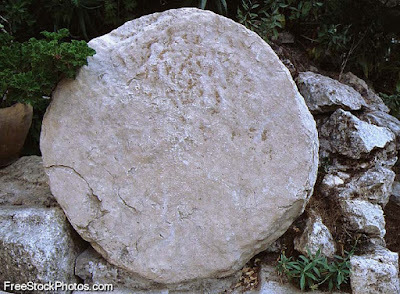 This made Peter, James, and John wonder "what rising from the dead meant" (Mark 9:10). 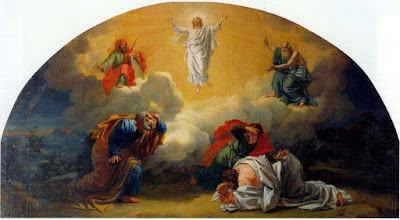 Each time we ascend the mountain to participate in Mass we, too, witness a Transfiguration; the transformation of the bread and wine into the body and blood of Jesus Christ. Does your participation leave you awestruck? As noted last week, "Lent" means "springtime." Spring is the time when what appears to be dead comes back to life. The miracle of this is not negated by the fact that we know so much about how this cycle works. In fact, our wonder should be enhanced by such knowledge. I think a good question to ponder over this next week of Lent is "What does rising from the dead mean?" You need to ask yourself this question in a serious way, which is the only appropriate response to such serious readings and not in some superficially sentimental way. Asking this in a serious way may take this form: "What needs to die in me so that I can rise to new life?" For better and sometimes for worse, Billy Graham was a giant striding across the religious landscape of the United States. Graham passed away this past Tuesday, 21 February, at the age of 99. Like many religious figures who enjoy popular acclaim, Graham, at least for a time, came to believe in his own power and wisdom. This led him to become more wrapped up in politics and attempts to influence governance than any Christian leader ought to allow him/herself to be. The apex of Graham's political influence occurred during the disastrous presidency of Richard Nixon. It seems to me that Graham learned from this experience and for the last roughly 45 years of his life he largely eschewed seeking the kind of influence he sought prior to and during the Nixon administration. In short, being that politically involved compromised his integrity and, in a serious way, his Christian faith. It this compromise with worldly power that many people will remember most about him. But it is clear to me that Graham learned from this and repented by changing the way he engaged. Graham's change was not a dramatic shift. It was marked more by what he ceased doing than by what he did. His change entailed going back to what he was - an evangelist. A herald of the Good News of Jesus Christ. I must admit that I scoff at the idea that Graham was "America's pastor." I scoff for two reasons. The first reason, I've already mentioned: his attempts at pastoring presidents were pretty much disasters. Such attempts are inherently disastrous because more likely than not the would-be "pastor" is being played, that is, co-opted. In seeking "pastoral counsel," presidents and political leaders are generally looking for moral cover. Graham's 13-page letter urging President Nixon to bomb North Vietnam (see "A Prince of War Exposed") must certainly count as the nadir of his long career. My second reason for scoffing in Graham's case is that he was not a pastor, but an evangelist, which is a very different calling. 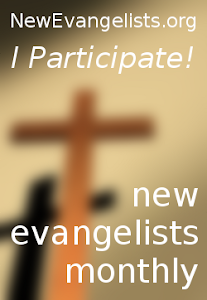 If anything, a pastor must, at least to some extent, be an evangelist but evangelists in no wise require pastoral skills. Hence, I think Kenneth Woodward's "America's Preacher" is far more apt than "America's Pastor." True pastoring requires the willingness to confront and challenge as well as the ability to comfort and console. The Church must maintain some distance and independence from worldly power if we are to remain true to our prophetic calling. To employ a worn out phrase, like the prophet Nathan (see 2 Samuel 12:1-25) and John the Baptist (Mark 6:17-29), the Church must always be able to speak the truth to power. 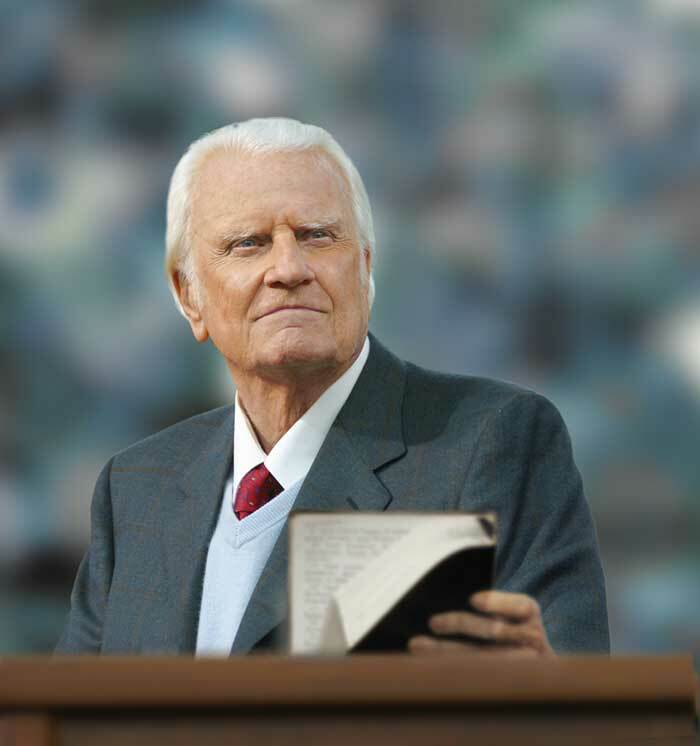 Nearly seven years ago, on a Sunday, I posted on Billy Graham (see "Christ can fill that cosmic void in your heart," which features a video of Graham preaching). Reading David Gushee's recent memoir, Still Christian: Following Jesus Out of American Evangelicalism, I was reminded that "Evangelical" (with a capital "E") in the American context was, at least initially, a Protestant identity that sought to exist between the extremes of Fundamentalism and theological liberalism. Fundamentalism, based what were articulated as "the fundamentals in about 1920. To make a Catholic analogy, "the fundamentals" can be viewed as something akin to U.S. Protestantism's syllabus of errors. The fundamentals were formulated to combat theological liberalism. Gushee's point is that Evangelicalism was either high-jacked by Fundamentalists or was nothing but a thinly-veneered attempt to forward Fundamentalism under a more moderate guise. 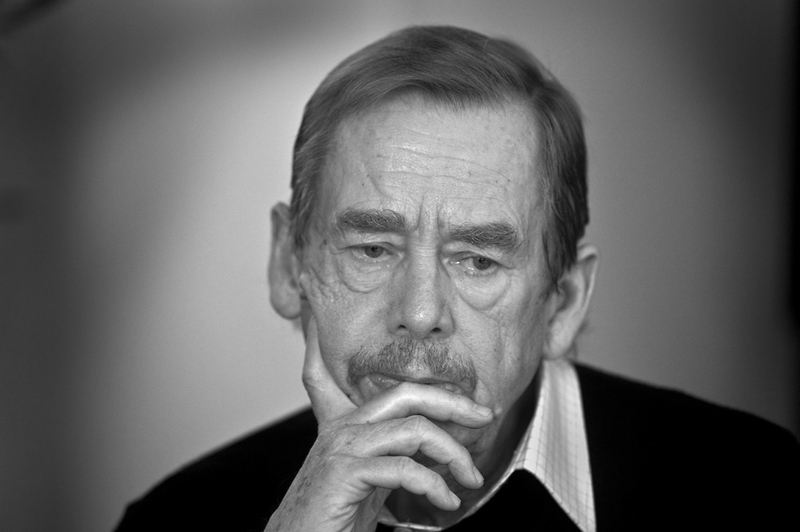 Gushee, who, at least for a time, was a prominent voice among the Evangelical left, writes deftly in his memoir about being played and the compromise inherent in serving as a Christian religio-moral advisor to politicians and political movements. There can be no doubt that Billy Graham, while an Evangelical, always remained somewhat rooted in his native fundamentalistim and so tilted towards the fundamentalist side of the Evangelical spectrum. His son, Franklin, is a fundamentalist and not an Evangelical in the least. Among advanced Western societies, no nation builds myths like the United States. Billy Graham's death has led to no end of myth-making, of hagiography, about this legendary preacher, both in the religious and secular media. We seem to have a difficult time dealing with the complexity of reality, especially when it comes to a person whose public career spanned some 60 years. Like most people, including Christian leaders, Billy Graham leaves a complex and mixed (i.e., human) legacy. Requiscat, Billy Graham, in pace. Since the first of the year I have been immersed in writing what I am sure is an extremely mediocre paper on Samuel Beckett. 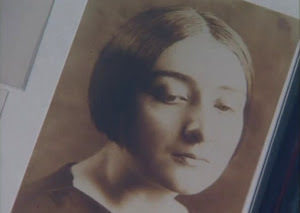 But I don't let the mediocrity, or downright horrible nature, of my work interfere with taking a journey. Writing this paper has been a great journey. The works of Samuel Beckett have fascinated me for the better part of the past 15 years. I really came to Beckett through his dramatic works, his plays, especially his later plays. 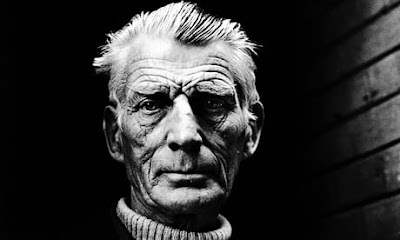 In fact, for my paper, entitled "Samuel Beckett: Good Friday's Child," I undertake an analysis of sorts of his play That Time but also draw from the work for which he will best be remembered, Waiting for Godot, as well as Not I. Why am I writing a paper, let alone a paper on Beckett? 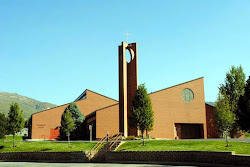 I am pursuing a doctorate of ministry through Mount Angel Seminary in Oregon. The paper is my term paper for an amazing class (I have only had amazing classes in the program), The Catholic Imagination. It is a paper on the theological/pastoral phenomenon of hopelessness, despair, and the anxiety that arises from experiencing these things, something very common in advanced societies of late modernity. One aspect of Beckett I was able to mention only in passing was the profound effect music, especially music from the classical (the actual era, not just the general grouping of all musical compositions that are not folk, rock, punk, country, New Wave, rap, rhythm, etc.) and romantic periods. The play features three voices: A, B, C. In his stage directions, Beckett specified “Voices A B C are his [the Listener’s] own coming to him from both sides and above.” He further stipulated that the voices “modulate back and forth without any break in general flow except where silence is indicated.” The voices are those of the Listener at different times of his life. A is the voice of middle age attempting to recall youth. B is the voice of childhood seemingly verging on adolescence. C seems to be the voice of old age. The play runs continuously, except for two 10 second pauses during the play, a seven-second pause at the start of the play and a 15-second pause bringing That Time to its end. 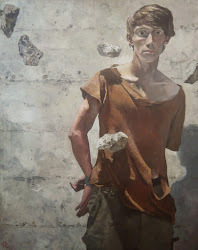 Beckett was also deeply influenced by painting (see "Coming to terms with density of what we see"). Today, I ran across this piece by Sean Doran, which ran in The Guardian several years ago: "Why music struck a chord with Beckett." Doran begins his piece with a three word quote by Beckett: "Music always wins." 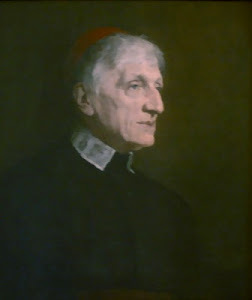 Apart from noting that Beckett had a great fondness for several modern composers, namely Debussey, Ravel, and Poulenc, he was most drawn to and influenced by Haydn, Beethoven and Schubert, whom Doran described as Beckett's "holy trinity." I like Beckett all the more based on his distaste for Wagner, whose music has never done anything for me. I would disagree about Mahler, however. I love his Resurrection Symphony (Symphony No. 2). Our traditio for this First Friday of Lent, an Ember Day during an Ember Week, is the second movement of Beethoven's Sonata Pathétique (Number 8 in C mminor, Opus 13). The pianist is Daniel Barenboim playing the piece live in Berlin in 2006. As odd, perhaps even as offensive, as it might sound, Samuel Beckett is a member of my Community of the Heart. Our first reading, taken from Genesis, and our New Testament reading, which is a passage from St Peter’s First Letter, are explicitly about baptism. We begin Lent with a consideration of baptism, which is the fundamental sacrament of the life of grace, because Lent is about renewing, or, for our Elect, entering into, our covenant with God. From the beginning of the world, God has sought to make a covenant with humanity so that he can enjoy communion with us and we can enjoy communion with God, who is himself a communion- Father, Son, and Holy Spirit- as well as communion with one another and the with rest of creation. Our Gospel today, occurs after Jesus’s baptism by John in the Jordan and tells of his forty days in the desert when he was tempted by Satan as well as ministered to by the angels. When he emerged from this intense forty-day experience, he began his public ministry with these words, which words constitute the heart of our Scripture readings on this First Sunday of Lent: “This is the time of fulfillment. The kingdom of God is at hand. Repent, and believe in the gospel” (Mark 1:15). The Greek word usually translated as “repent” is metanoia. Metanoia, in turn, is a compound word: meta + nous. Meta means, literally, “above,” “over,” or “beyond.” Nous is the Greek word for mind. Literally, repenting means to have a transformed or converted mind. Repentance means being committed to overcoming many of your natural tendencies and reactions. To repent means possessing the mind of Christ by the power of the Holy Spirit (1 Cor 2:14-16). Repenting means being transformed so you can resist the temptation to think, speak, and act solely out of self-interest. Looking out for yourself first and last means thinking, speaking, and acting in ways that often trigger feelings of bitterness and negativity that result in a lack of empathy, or even sympathy, for others. Repentance means being resolved, with God’s help, to meet every situation you face, however unfair it may seem, with understanding and an empathetic heart. While true repentance brings you to an awareness of your alienation from God, from other people, and from the rest of creation, at the same time it transforms the way you perceive the world, others, and yourself. By repenting, you come to see that penances are not punishments and that to live in a penitential way means to live selflessly in imitation of Christ out of love for God and neighbor and to discover in this true joy. As noted, the prefix meta refers to something that comes to us from beyond ourselves. So, at least in the first instance, metanoia, that is, true repentance, is a grace. The ability to truly repent is not something we are capable of on our own. To relate it to the last sentence of Jesus’s proclamation, to repent includes believing in the Gospel. To believe in the Gospel means not only believing that Jesus is the Good News and the kingdom of God in person, it means following him and living as his disciple, which means committing yourself to a life of conversion, a life of growth and change. Being a Christian is about living in relationship, in communion with God, other people, and the whole of creation. Our gathering for Mass should build us into a community rooted in Eucharistic communion, rooted in Christ. It is by faith, which is our response to God’s initiative, that we are transformed. As St. Peter tells us in our second reading, our transformation begins in the waters of baptism, which “is not a removal of dirt from the body but an appeal to God for a clear conscience, through the resurrection of Jesus Christ,” who “suffered for [our] sins… the righteous for the sake of the unrighteous, that he might lead [us] to God” (1 Pet. 3:18.21). It is by being baptized, then, that we enter into a covenant relationship with God. Rather than using water to destroy, in baptism, God uses water to give us life in keeping with the covenant he entered into with Noah. In our Christian tradition, Lent cannot be understood apart from the final stage of preparation for those preparing to be baptized at the great Paschal Vigil. At the Vigil, our Elect- Tiffany, Magnin, Dahliana, and Brennan- will be baptized into Christ. To this end, by their participation in the Rite of Election [earlier today] yesterday, they went from being Catechumens to being those elected by Christ in the person of Bishop Oscar to receive new life through rebirth in baptism, which is life eternal. The bishop also called our Candidates- Scot, Paul, and Brad- to continuing conversion. They are called to convert over the course of Lent so they are ready to have their baptism confirmed and enter into full communion with Christ and his Church at the great Vigil. For those of us already baptized and fully incorporated as members of Christ’s Body, this intensified period of prayer, fasting, and alms-giving is a time to actively renew our own baptismal covenant, to repent and begin living lives more conformed to Christ. At the great Paschal Vigil, we will renew the promises we made when we were baptized. An indispensable means Christ has put at our disposal for this time of renewal is the Sacrament of Penance. By making a good confession, receiving absolution, and making satisfaction for your sins by carrying out your penance, you are restored to the grace you first received in baptism: the state of original grace, the state of communion. My friends, Lent is about conversion. It is not about making ourselves uncomfortable in small and trivial ways. God is always seeking to transform us. The transformation God seeks, which requires your cooperation because God never forces you, is to become who you are, who God, out of love, created, redeemed, and is now sanctifying you in and through this Eucharist to be. Once transformed, God entrusts us with the mission of reconciling the world, of restoring it to the state in which all things were originally created, the state of grace: the state of communion. “Lent” means springtime. Spring is the time when what appears to be dead comes to back to life. Today, on this First Sunday of Lent, Christ calls each one of us and all of us together back to life. Repenting is how you come to know that the Lord’s ways “are love and truth” (Ps. 25:10). "Hunger stays 'til it's fed"
Well, it's Friday again. My, how a week flies by! Today is not the first Friday of Lent. 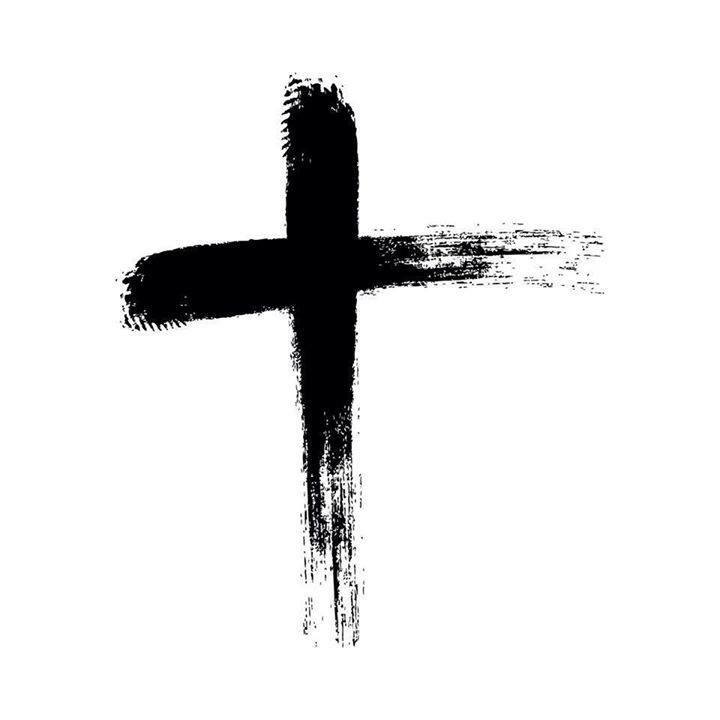 The First Friday of Lent is next Friday. Today is the Friday After Ash Wednesday. Hence, the first 4 days of Lent are a kind of warm-up, a time to get started on your preparation for the great Paschal Vigil, for Easter, when we will renew our baptismal promises. Lent is only a holy season if we use to express our hunger and thirst for holiness. Our hunger and thirst for holiness can only be satisfied by Christ. This is why the Eucharist is so vitally necessary. Being satisfied by Christ means being transformed and conformed more and more to his likeness. Christ-likeness is made most manifest by our care for those in need. So, in terms of the Lenten disciplines of prayer, fasting, and alms-giving, one's holiness is made manifest by selflessly giving to and personally helping those in need. 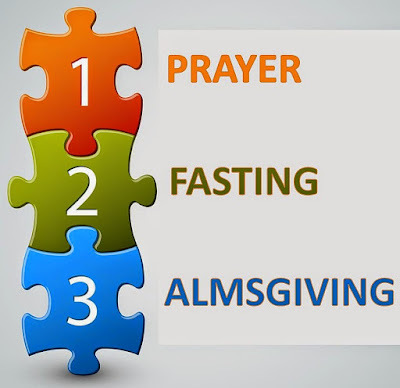 I am convinced that there is a wholeness to prayer, fasting, and alms-giving. I also convinced that fasting connects prayer to alms-giving in a variety of ways. 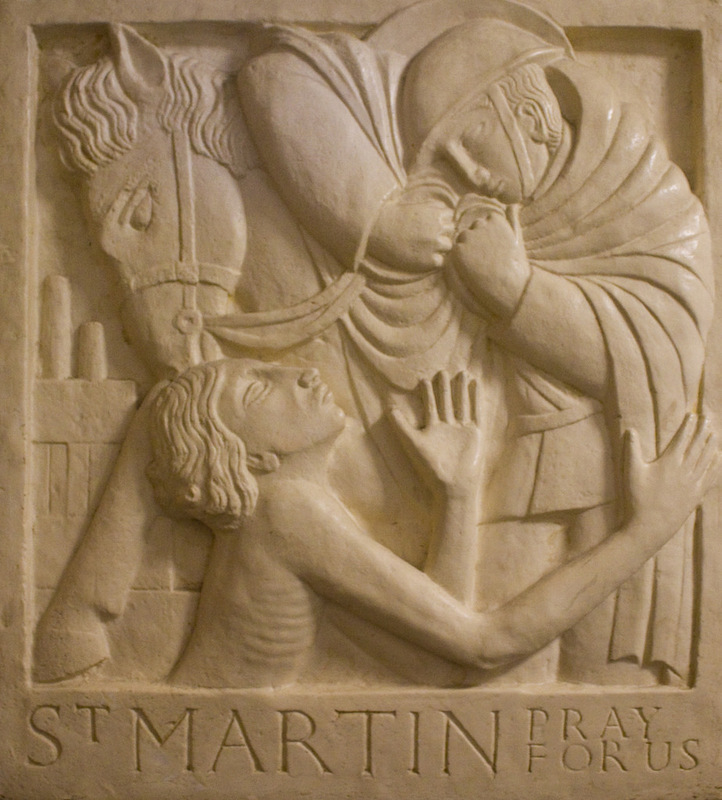 Without a doubt the most concrete way fasting connects prayer to alms-giving was highlighted by Pope Francis in one his homilies: "You pray for the hungry. Then you feed them. That's how prayer works." The means you use to feed the hungry is what you go without while fasting. When you fast, you either do not eat anything or you eat very little. What you do eat because you are fasting is to be given to those in need. I think fasting also shows those of us who live in affluent societies and who are relatively well-off that we can and, in most instances, should live on far less than we are accustomed to consuming. This, in turn, should turn more towards God. There is no "magic" to any of this. Fasting is not glamorous. It can be and usually is a bit difficult. If you fast, chances are at some point you'll grow hungry and want to eat. It is then that you turn to prayer, acknowledging to God what you are really hungry and thirsty for- righteousness, true righteousness, not fake righteousness or self-righteousness. I suppose that's probably enough from the soapbox for the Friday after Ash Wednesday. Today Roman Catholics, Anglicans, Lutherans, many Methodists, and Presbyterians, as well as sundry other Western Christians, begin our annual observance of the holy season of Lent. Today, Ash Wednesday, nearly as many Roman Catholics will turn up for Mass as turn up on Christmas. Of course, in return for their effort each one, at least in the U.S., will receive a black smudge of palm ashes on her/his forehead. The popularity of Ash Wednesday is difficult for me to fathom, especially given that the number of people who come to Mass on Ash Wednesday is likely greater than those who turn up on Easter. Speaking only for myself, if I did not believe Christ rose from the dead I sure as hell would not participate in Ash Wednesday! I'd just keep reading Beckett, who at least does some pointing beyond. I find it interesting that Ash Wednesday is not a holy day of obligation. Hence, there is no requirement to attend Mass on pain of sin. Each Roman Catholic between the ages of 14-60 is obligated to fast. Fasting means no eating the meat of warm-blooded animals and, if you eat, what you ingest over the course of the entire day should not amount to more than one small meal. I know, to state things that way is to run the risk of taking a legalistic approach. But having some guidance is most useful. 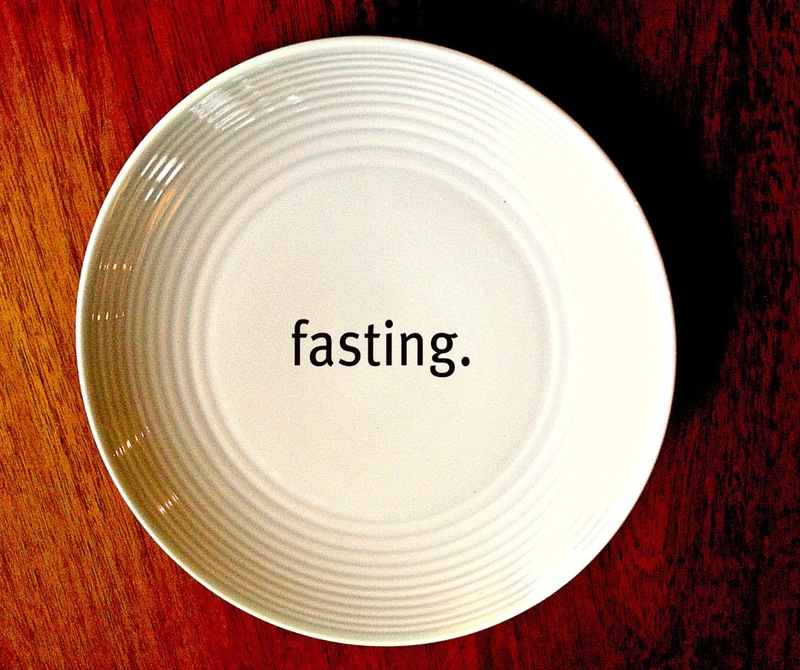 Fasting is the lost spiritual discipline. In a society of plenty, it is difficult to fast, to voluntarily go without food. The link between fasting and alms-giving is also something that has faded. The link between the two is quite simple: I go without and give what I go without to someone in need. This is faith in action. Another word for faith in action is love. I think another thing that bears noting is that Lent is not a time for self-improvement. The disciplines of prayer, fasting, and alms-giving are focused on more intensely so that our love of God and neighbor, by the grace of God, might increase. 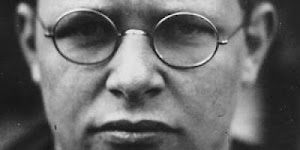 Dorothy Day once challengingly averred something along these lines: I only love God as much as I love the person who I love the least. When it comes to focusing on love, true love, Ash Wednesday puts the comparatively shallow Hallmark holiday of Valentine's Day to shame. For Christians, it is the Cross, not a heart, that is the sign of enduring love. As St. Gianna Molla observed: "Love and sacrifice are closely linked, like the sun and the light. We cannot love without suffering and we cannot suffer without love." Each Lent there is a quote by James Kushiner to which I turn. I turn to it because I think it gets the spiritual life just right: "A discipline won't bring you closer to God. Only God can bring you closer to Himself. What the discipline is meant to do is to help you get yourself, your ego, out of the way so you are open to his grace." The quote is from a sermon by the late Passionist priest, Fr. Harry Williams. Lent is not a time to inflict the wrath of God upon yourself. In the first instance, God has no wrath toward you, only love. Lent, which is derived from an Old English word, means springtime. Springtime, of course, is that time when things that appeared to be dead come back to life. Christ, the Good Shepherd, came so that you and I might have life and it more abundantly (John 10:10). An abundant life is a self-sacrificing life. I pray each one of you has a blessed Lent. 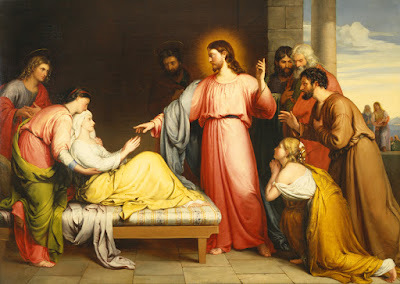 "Let us then go to him outside the camp"
In today's Gospel, Jesus did something an observant Israelite was never to do: "he stretched out his hand [and] touched" a leprous person (Mark 1:41). While the man was made clean, Jesus was rendered ritually unclean. Our passage from Leviticus makes it clear that a leper "shall dwell apart, making his abode outside the camp" (Lev 13:46). 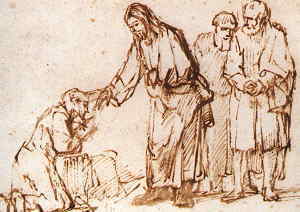 While not a direct result of being rendered unclean by his contact with the leprous man, but rather due to the man's inability, despite the express command of the Lord, to keep what Jesus had done for him to himself, the Lord was relegated to remaining "outside in deserted places" (Mark 1:45). 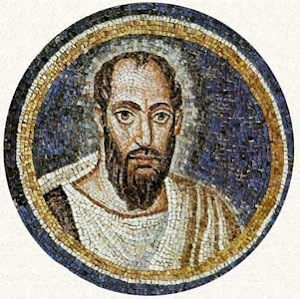 St Paul, in our second reading, tells the Christians of ancient Corinth to imitate him as he imitated Christ (1 Cor 11:1). How did Paul imitate Christ? He imitated Christ by not seeking to do what benefited him but by seeking the good of everyone else for Christ's sake, which is to say for the sake of the Gospel (1 Cor 10:33). In The Flowers of St Francis, a literary work consisting of vignettes from the life of St Francis of Assisi, there is a beautiful story of Francis encountering a leprous man in a deserted place. While the saint did not heal the man of his physical disease and the deformities it caused, he affirmed the man's full humanity, not by merely touching him, but by hugging him. This is depicted beautifully, that is to say wordlessly, in Roberto Rossellini's amazing cinematic version of The Flowers. You can watch it here. The inspired author then exhorted his readers/hearers: "Let us then go to him outside the camp, bearing the reproach that he bore" (Heb 13:13). We bear the reproach he bore by bearing the reproach of others, especially those who our many of our fellow Church-goers are quick to dismiss and to exclude. I think perhaps the main lesson from today's readings is that nobody is excluded from God's reign. Notice that Jesus did not inquire about the man's worthiness. He simply heeded his plea. Those who run the greatest risk of being excluded from sharing in God's reign are those who are bent on excluding others now. I made it to Friday. I hope to did too. At least for me, this week that is no small achievement. Because I haven't had a chance to post, there is a lot on my mind. The foremost thing on my mind today is Lent. The holy season begins on Ash Wednesday, which this year falls on 14 February- the liturgical memorial of Saints Cyril and Methodius, brothers who evangelized the Slavic peoples. In other words, at least on the Church's calendar during when Ash Wednesday does not fall on this date, it is not St. Valentine's day. I am often asked, "What are you reading for Lent?" This year I am re-reading the Gospel According to St. Mark several times. Each time I am going to read a different English version. These will include the New American Bible, the Revised Standard Version, the Jerusalem Bible, the New Revised Standard Version, the King James Version, David Bentley Hart's New Testament: A Translation, and Eugene Peterson's The Message. For at least one of these readings, I am using Rowan Williams's Meeting God in Mark: Reflections for the Season of Lent. Since this year marks the fortieth anniversary of its initial publication, I am re-reading Richard Foster's Celebration of Discipline. I am supplementing that with Renovaré resources, especially Nathan Foster's podcasts on the disciplines. Finally, I am reading Rowan William's Being Christian: Baptism, Bible, Eucharist, Prayer. I would encourage everyone reading this to read Pope Francis's Message for Lent before Wednesday (it's short). Since there are 4 days before our Lenten journey gets underway, it's a good time to bring up fasting and its importance for the spiritual life. How about this year we not and avoid and evade fasting? I mean true fasting, not "fasting" from this, that, or the other thing but actual fasting from food. Fasting is a spiritual discipline taught by the Lord himself to his disciples and proven by disciples over the course of the Church's pilgrimage through time. Sadly, I've already seen a few, but, as Lent approaches, I expect to see more well-intentioned Catholics posting no need to fast memes and quotes saying things like - "It's better to hug your dog with great affection than to fast from food." 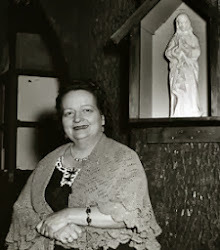 In an effort to help with discernment, I think it is important to consider that many of these quotes by well-known spiritual masters and saints of the past date from a time when observant Catholics were obligated to fast a lot, some might say excessively. But in an age when virtually nobody fasts and the major concern of far too many Catholics going into Ash Wednesday, at least by many in wealthy countries where over-eating is a daily occurrence, is "How much can I eat and still be considered to be fasting? ", such things strike me as spiritually ill-advised. I love my dog, by-the-way. I hug her everyday. I will likely hug her on Ash Wednesday. One effect of fasting, of choosing to go without, is that it makes me more thankful for what I have and more conscious of what others don't. Fasting strengthens my commit to work for justice. Weeks during which I take my spiritual discipline seriously, I practice lectio divina with the readings for the coming Sunday. I find this beneficial both personally and as a preacher. This past week I managed to do this. Of course, at the center of the Bible and of each Sunday's readings one finds the Gospels. In our Gospel for this Sunday, Jesus is clearly presented as a healer of body and soul. It seems to me that Christians in who live in advanced societies are somewhat uncomfortable with Jesus being portrayed as such, at least as strongly as the Gospel of Mark portrays it. 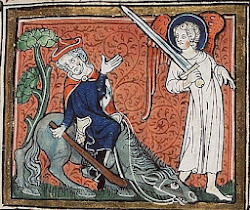 Our first reading, which marks a rare occasion on which we read from the Book of Job in the three-year Sunday lectionary cycle, occurs after Job has been afflicted and has been upbraided by his friend Eliphaz, who wants to know what Job has done to earn God's wrath. Of course, Job, who is a just man, has done nothing to deserve what happened to him. In a very human, which is not to say sinful or disgraceful, manner Job rues his life. It's interesting that the lectionary reading is Job 7:1-4 and, skipping verse 5, 6-7. Once this gap is noticed, the question it prompts is almost inevitable. What does verse 5 say? It says: "My flesh is clothed with worms and scabs my skin cracks and festers." Apparently, this is too grotesque to proclaim in the liturgy. As a result of the state in which he finds himself, Job looks forward to death with no hope. The conclusion of the passage: "Remember that my life is like the wind my eye will not see happiness again." 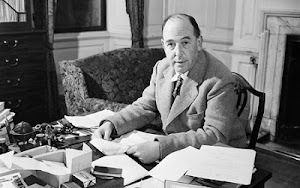 If I had to venture a guess, very few Catholic preachers dealt with the reading from Job at all, or, if they did, they did so in a cursory manner. This is sad because Job's words are words with which many people are familiar. Life is often difficult in a variety of ways. I think we make a mistake in rushing too quickly past suffering, misery and their effects. In a rush to reach Easter, you can't leap Good Friday in a single bound, nor should you want to, which is not the same as saying you need to go out and find ways to suffer. Don't worry, if it hasn't already, life will cause you to suffer. Rushing too quickly past pain, suffering and misery, I believe, truncates and attenuates the power of the Gospel, the power of which lies in experience, not words. Paul, too, in our second reading from 1 Corinthians, is complaining. Among other things, he trying to make sense of the suffering he endured while proclaiming, or endeavoring to proclaim, the Gospel. I don't mind sharing at this point that the phrase on which I meditated from the Job was "When shall I rise?" It's important, however, to put the phrase in context. In the context of the passage and even the verse (verse 4) in itself, the phrase is not a metaphysical question: "When I lie down I say, 'When shall I arise?' then the night drags on; I am filled with restlessness until the dawn." It is about making it through a long night of suffering. In the reading from Paul's letter I found something of an answer to the question "When shall I rise?" I shall rise when I do everything for the sake of the Gospel. Doing everything for the sake of the Gospel means living selflessly as a sacrifice for others without complaining, seeing it as a blessing, the lifting of a burden, not an imposition of one. At least for me, self is the biggest burden I carry. I will rise when Jesus heals me. Living for the sake of the Gospel requires me to be a man of prayer, which, in turn, requires me to go to deserted places. A deserted place is a place devoid of people. In our Gospel, Jesus has spent the day not merely surrounded by people but engulfed by humanity. While Mark gives some indication that not everyone was healed, he gives no indication that Jesus turned anyone away. I think it's fair to say, for Jesus, it was an exhausting day. Nonetheless, the Lord arose before the dawn the next day in order to go to an empty place and pray. We also learn in very clear terms that Peter was married. His disciples, perhaps awakening and realizing he was gone, "pursued" or "hunted" for him. I am no expert in Koine Greek, but I like the term "pursued," preferring it to other English words one might employ in translation. They pursued Jesus. They found Jesus. What did they tell him? "Everyone is looking for you." But he did not say, "Okay, let's go back to Capernaum." They left and went to other Galilean towns and villages. We have a tendency in our spiritual lives to want to go back to those "good times," times when prayer seemed easy, answers immediate and generous, etc. Because it is part of life, in the spiritual life there is no going back. Jesus calls us ever forward. It seems to me that this truth is a source of tension in the Church at present. As the barque of Peter sails over the ocean of time it is not unusual to encounter choppy waters and even gale force storms but we're always headed for the farthest shore despite the temptation to head back. I realize this a bit disjointed but I think sometimes writing and sharing unvarnished thoughts can be useful. Yesterday being Friday and the first Friday of the second month of 2018, I had planned to post a traditio. But life supersedes blogging. Actually, I posted more in January than I thought I would, even though I missed posting thoughts on the Sunday readings last week. Nonetheless, yesterday we did celebrate the Solemnity of the Presentation of the Lord. Since it was a solemnity that fell on a Friday, I enjoyed a Philly cheese steak sandwich for lunch. I also unapologetically ate a lovely potato, cheese, and sausage dish for supper. 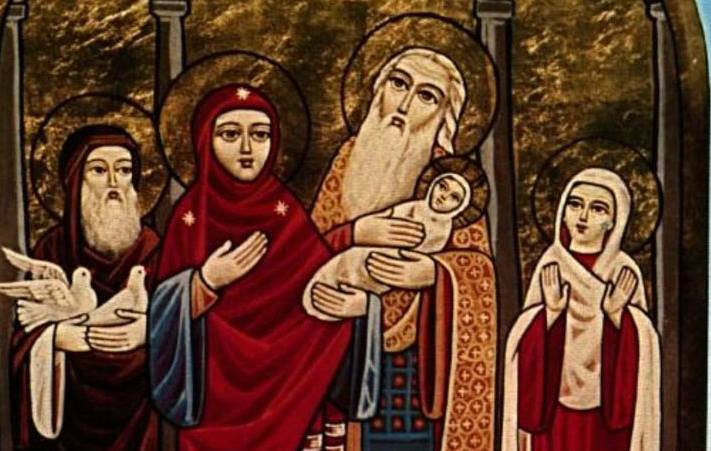 The Presentation of the Lord is the Church's commemoration of that day when Mary and Joseph brought the infant Jesus to the temple in Jerusalem in order to fulfill all the Law of Moses required with regard to a firstborn son. This is set forth in St. Luke's Gospel (2:22-38). This marked the beginning of Jesus's perfect fulfillment of the Law, doing is his own person what Israel, throughout her history, was unwilling and incapable of doing on her own. 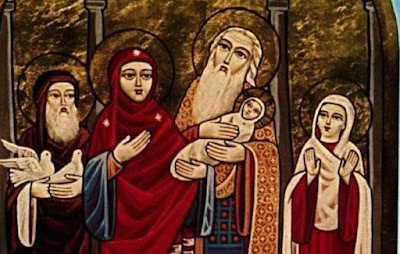 Traditionally, the Solemnity of the Presentation of the Lord, which marks the outer most boundary of Christmas, has also been known as Candlemas. Because of this, part of the observance of this solemnity has consisted and still consists in many places of blessing candles brought to Mass by the faithful. In our day, the age of electric lights, these blessed candles are used for devotional purposes in our homes. Like holy water and blessed salt, these blessed candles are sacramentals. According to the Second Vatican Council, sacramentals "are sacred signs which bear a resemblance to the sacraments: they signify effects, particularly of a spiritual kind, which are obtained through the Church's intercession" (Dogmatic Constitution on the Sacred Liturgy, Sacrosanctum Concilium, sec. 60-61). By means of sacramentals, Christians "are disposed to receive the chief effects of the sacraments" (Ibid). I don't mind sharing that I brought home a blessed candle for use when I am depressed and/or feeling anxious. It is in the context of this lengthy pericope in the second chapter of St. Luke's Gospel, that Simeon, who, along with the prophetess Anna (she receives short shrift) recognizes in the baby Jesus the fulfillment of their hope, that of their people, and, indeed, the whole world, filled with the Holy Spirit, like so many in Luke's Gospel and its sequel, the Acts of the Apostles, sings what subsequent tradition knows as the Nunc Dimittis (Luke 2:29-32). Nunc Dimittis are simply the Latin words for the beginning of this hymn: "Now you [may] dismiss..." Along with the Blessed Virgin's Magnificat (Luke 1:46-56) and the canticle of Zechariah, known as the Benedictus (Luke 1:67-79), the Nunc Dimittis is one of the three so-called "Evangelical Canticles" given us in the first two chapters of St. Luke's Gospel. These three canticles are occupy a central place in the liturgical prayer life of the Western Church. Each is recited every day in the Church's prayer, known as the Liturgy of the Hours. The Benedictus and Magnificat are part of what are known as the "hinge" offices of the Liturgy of the Hours. These hinge offices are Morning and Evening Prayer. Traditionally, Morning and Evening Prayer are known as Lauds and Vespers, respectively. The Nunc Dimittis is part of Night Prayer, known also as Compline, which, along with the Office of Readings, constitutes the second tier of the Liturgy of the Hours, after the hinge hours. Simeon, who, with Anna, was among the most of Israelites, recognized that God's salvation, while from the Jews, extends to everyone. In the words of the hymn by Rev. F. Pratt Green: "Christ is the world's light, Christ and none other; born in our darkness, he became our brother."